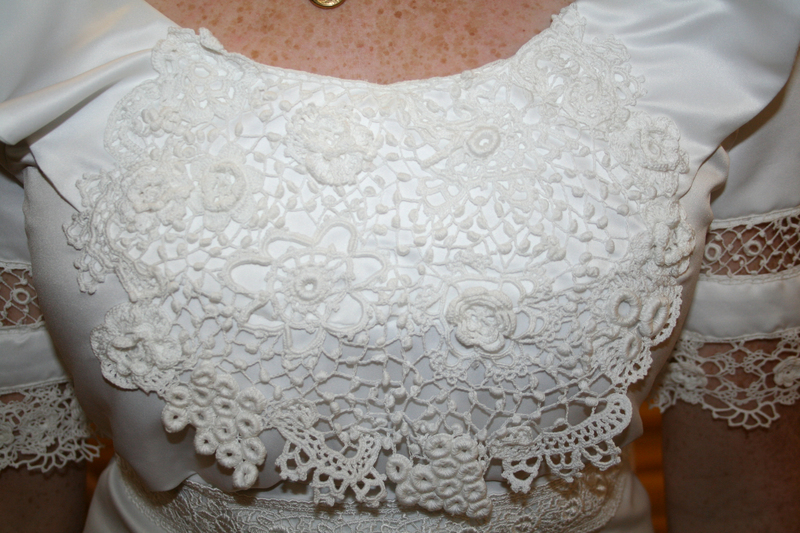 This intricate piece of Irish lace is one I made for the front of a friend’s wedding gown. 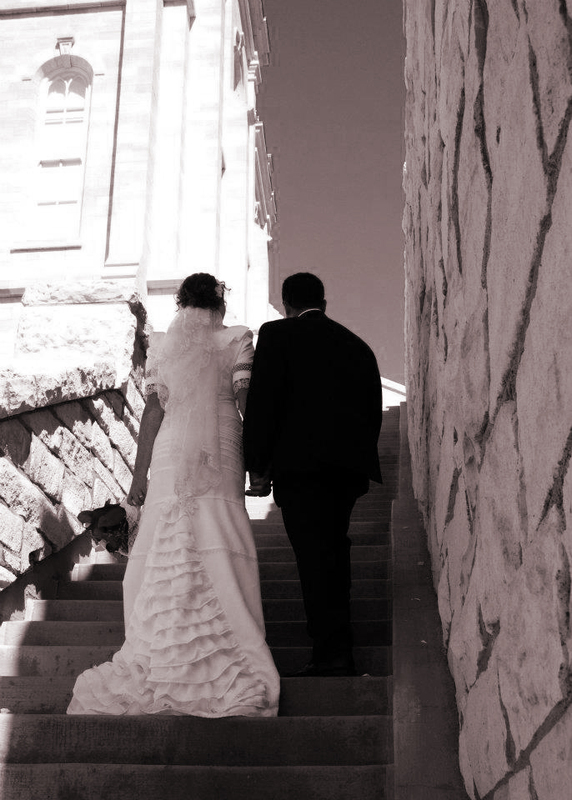 She was married in the beautiful Manti temple, and wanted a traditional Scotch-Irish theme for her reception. All the men wore traditional kilts and her wedding dress was laced with bits of Ireland. MJ Stegeby, and I worked this lace together. 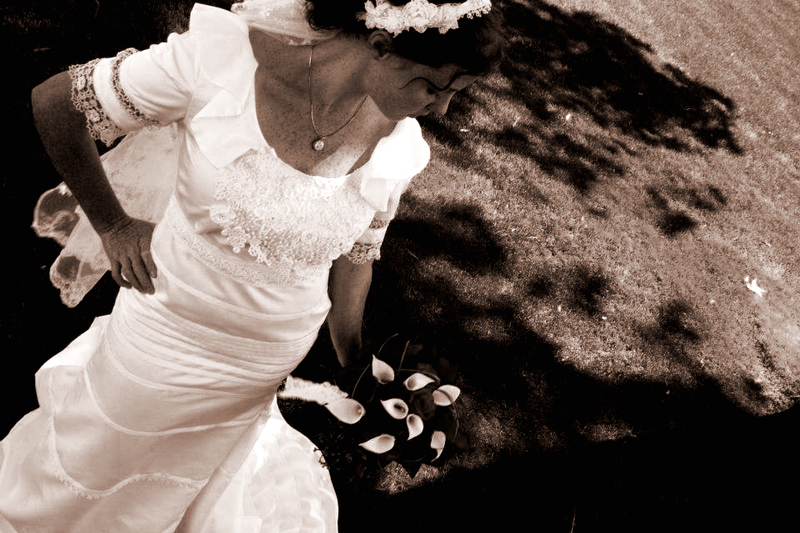 The back of the dress has clusters of Irish roses just above the train, Irish roses are in her hair, and the sleeves are sprinkled with roses, clones knots, and insert lace. This was one of my favorite lace projects. A beautiful couple, with beautiful heritage, on a gorgeous day at the temple. 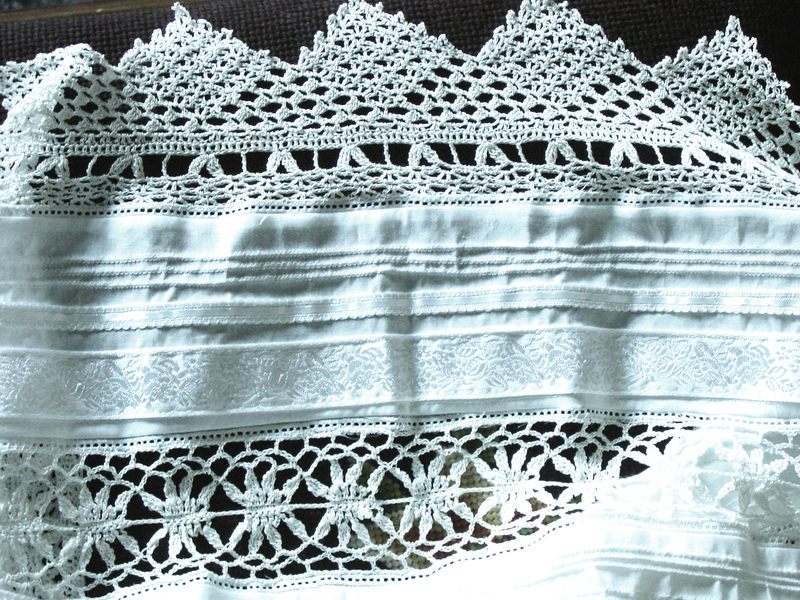 The Irish lace was constructed in parts. Each motif was made first, and then pinned to a sturdy surface, in this case a sheet of cardstock. Then the netting with clones knot picots was added to fill in between the motifs. This project took several months of patient labor, but the completed dress was worth it. This temple handkerchief was made for me by my husband’s mother shortly after we were married. It was made from a pattern designed by her Aunt Hannah. It is one of my treasures, and was with me for at least one temple dedication. Family, faith and beauty. There is a lot of history woven into each stitch of that beautiful edge. I had some time this afternoon so I modified the motif pattern from my previous design. I opened it up a little more so it is less dense. I like the balance between closed and open areas better, you can see what is going on in the lace. A good visual design gives your eye a path to travel, and the lace begins to tell a story. In old lace traditions, the lacemakers would use their skills as an art form, taking elements of their lives and experiences and working them into their laces. 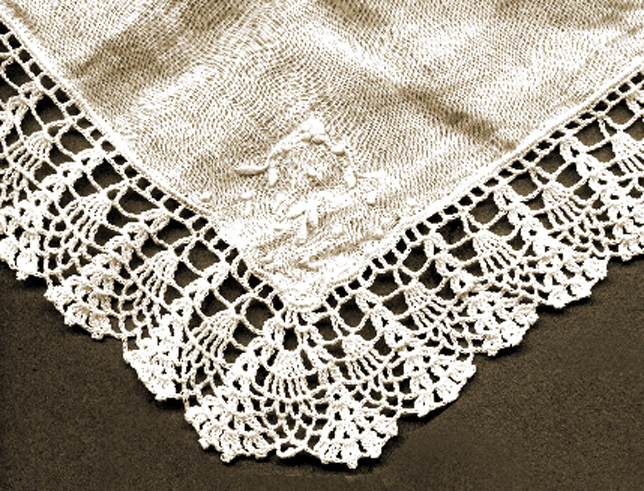 This next altar cloth lace has a story to tell. It’s a good one, and I want to get it right. I’m experimenting with lace design. This original creation is my newest try. I’m looking for a good design for my next altar cloth project. Altar cloth patterns need to be close woven designs so buttons don’t snag on them, but they still want them open enough to be lacy and beautiful. It is a constant tug of war between beauty and durability. So far, I like it. I don’t know if it’s the one though. 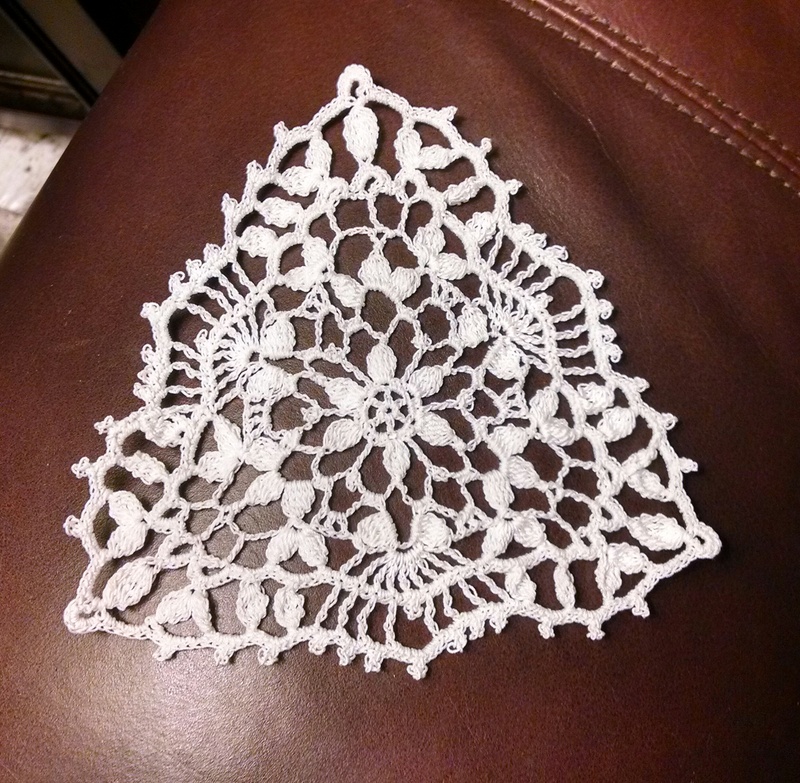 This six pointed lace motif was worked in size 20 thread. Not bad for a Sunday afternoon. 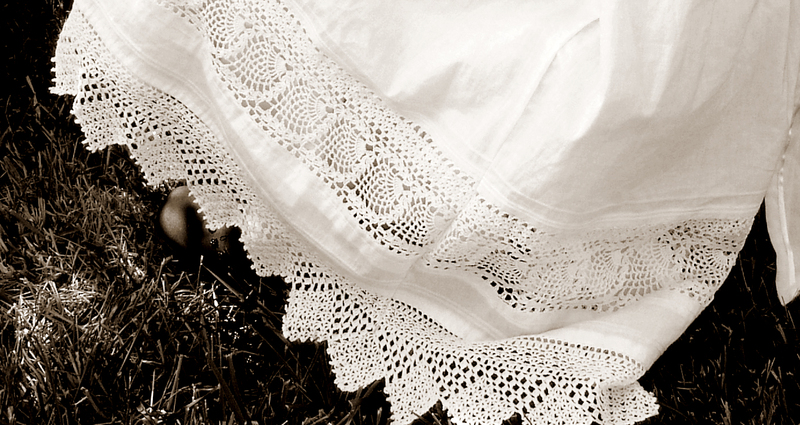 When Anna was baptized, she wore a dress I made with a variation on Grace’s lace edging. I modified it, this time with a pineapple insertion. I added the same snowflake extension, this time without the cluny clusters. I added the snowflake extension to the pineapple insert as well to tie the edgings together. The snowflake edging also goes around her collar, with a pearl button. I like the design of both dresses, but changing the elements definitely changes the look. This was a good experiment for me in lace design. This blessing dress was made for my niece, Grace. It’s an straightforward intermediate pattern, but dressed up with a few pintucks, ribbon, and an insert, the lace becomes a very fancy heirloom. 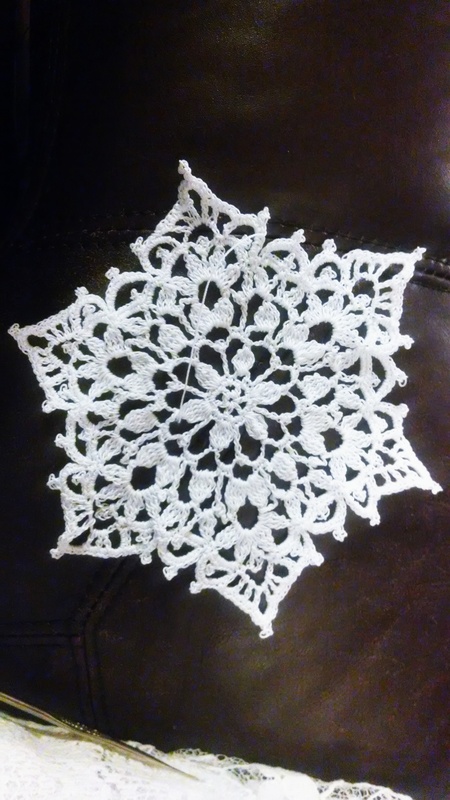 The lace edging is called “Snowflake Edging”. 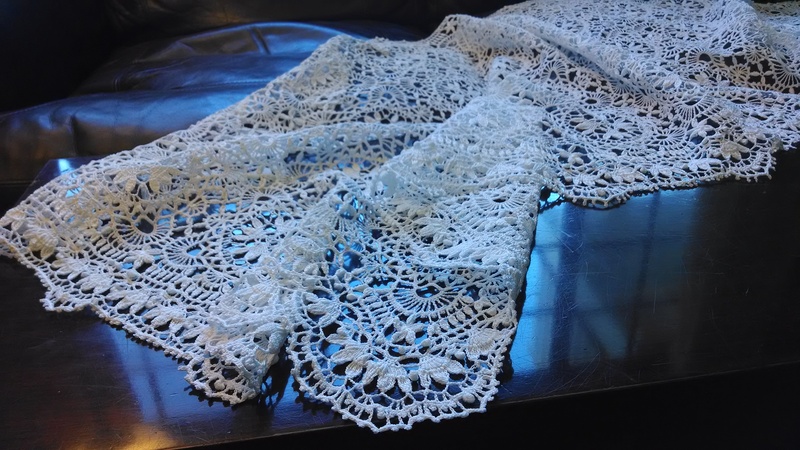 I extended the length of the lace with a matching header across the top of the lace to make it extra dressy, and to include some of the cluny clusters so the insert would match the edging. I really like the effect. The insert adds a row of pretty detail. This insert pattern is from an old pattern from the early 1900’s called “Cluny Insertion” from the Priscilla Crochet Book, Edgings and Insertions No. 2. It’s not a difficult pattern, but has a unique, old fashioned look I like. 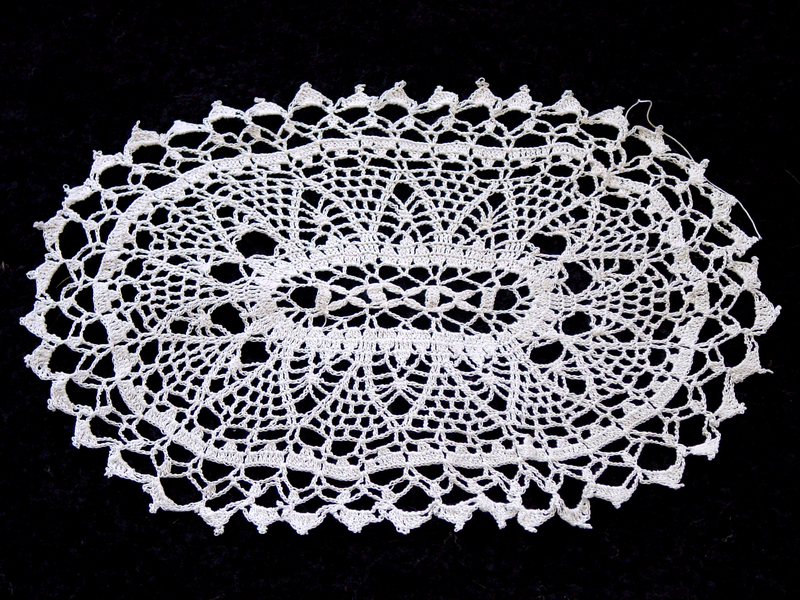 My grandmother made lace with only a handful of patterns, but she created endless variations of those patterns. I like that about her laces. This was the first lace I modified from the original pattern. Modifying a pattern makes it uniquely your own, and transforms a skill into an art. 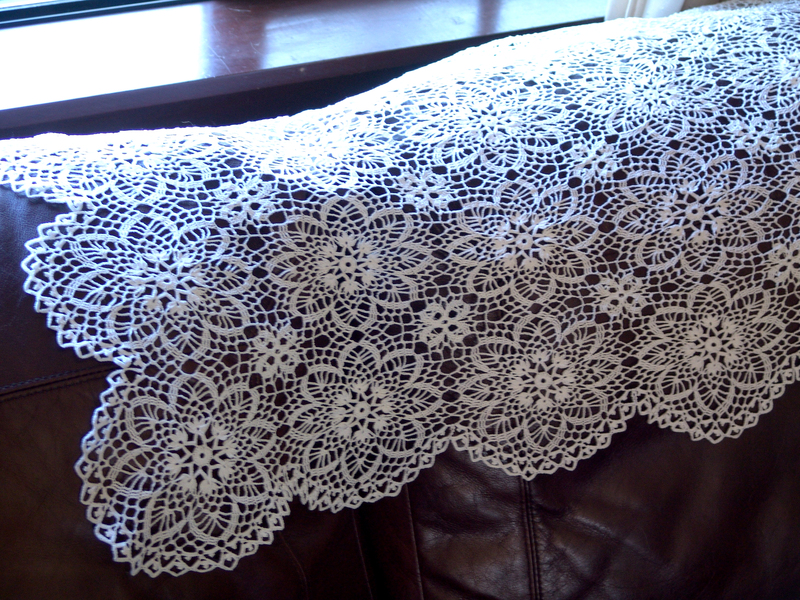 I made this lace doily as a gift for my husband’s Aunt. When the budget is small and the talents need practice, lace is the perfect gift. This one was made with size 30 thread. This lace was made by a good friend of mine, MJ Stegeby. She’d never made lace before, but knew how to crochet. She and I decided we would make temple altar cloth laces together, our gift to the Lord. I taught her what thread and hook to use, and she got started on hers while I looked for a pattern for mine. Her pattern is from the Crocheter’s Treasure Chest, and it’s called “Pond Lily”. Not long after she started her project, Mary Jo got a bad case of morning sickness. We were elated that she would be expecting, but the side effects were painful as she spent the next nine months fairly seriously under the weather. Still, in the quiet moments, she managed to work on her lace. Things got harder for them. Her husband lost his job, and they were eventually forced to move to another state as life continued to hit her little family in a big way. When I renewed my lace efforts with the Los Angeles Temple, and realized what a need there was for new laces to fit their altars, I talked to all the lacemakers I knew in my family and extended family, and I talked to Mary Jo. 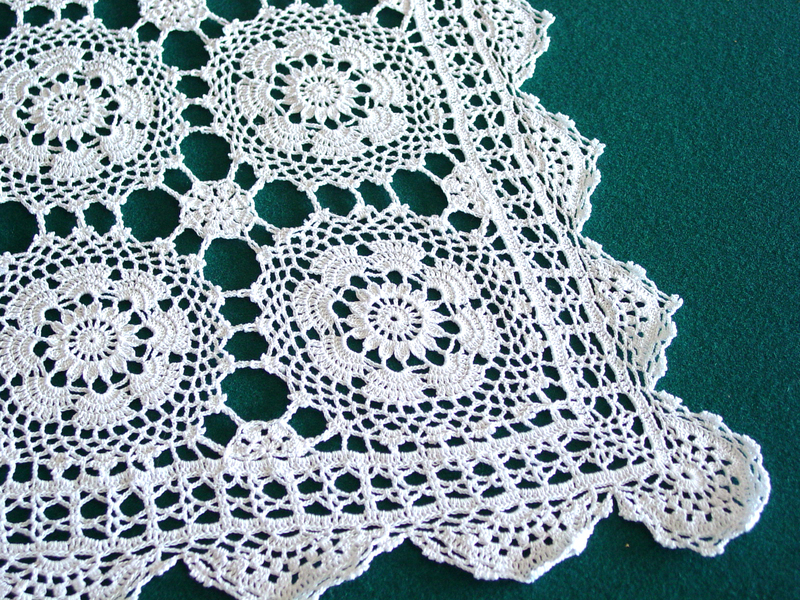 Mary Jo reminded me about the altar lace she’d started during those long months of struggle. So many things had gone unexpectedly wrong since then. Despite her best efforts, her gift to the Lord hadn’t gone quite as she’d planned. In addition, sometime in the chaos of moving, the pattern had been lost, and with it the string and the hook. But, she said, she still had the lace. She worried that her effort wouldn’t be very useful because it was so small, but we talked it over, and she decided she’d send me what she had. Even though she now lived out of state and had other temples she could send it to, places she could go to see her work on the altar, Mary Jo was firm. 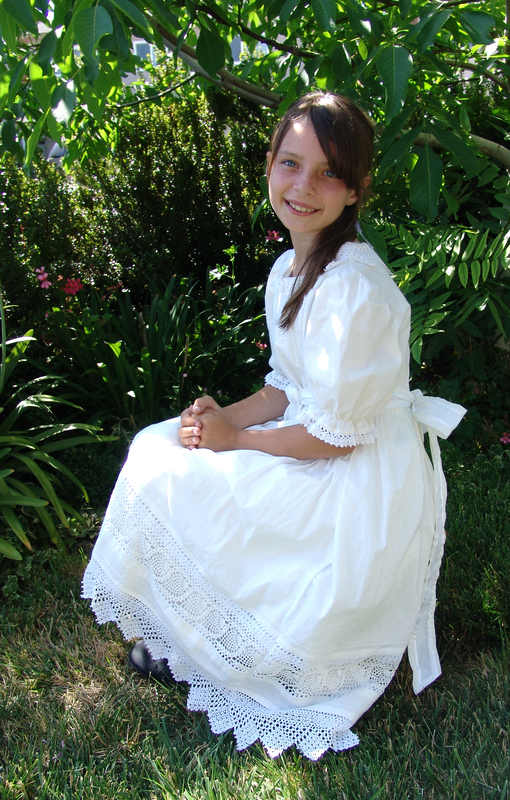 She wanted her lace to go in the Los Angeles Temple. She felt it belonged there. We decided I would take her started lace and go from there, making additional motifs until it was big enough to be usable. I had a copy of her pattern, “Pond Lily” in my pattern collection, but I didn’t know if my stitch size would be different than hers. No two crocheters have the same tension. If my stitching was very different, any new motifs I made would not match. Given the situation, and the need the temple had, I decided to give it a try anyway. When the lace arrived in the mail, it was beautiful, very small, and definitely unfinished. I measured it roughly and checked my list of altar sizes– I was amazed. Her “Pond Lily” lace appeared to be the right size for the smallest altar in the Los Angeles Temple, an altar that needed a piece of lace, badly. The lace hadn’t been washed yet. Washing shrinks the cotton thread by one inch in twenty. It also hadn’t been blocked. 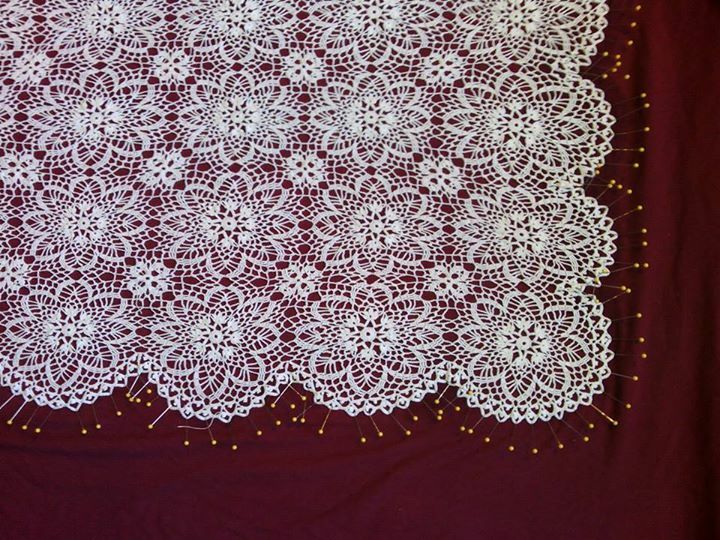 Blocking stretches the lace to make the holes uniform and gives the piece a finished, completed look, that holds its shape and allows the lace to drape nicely. 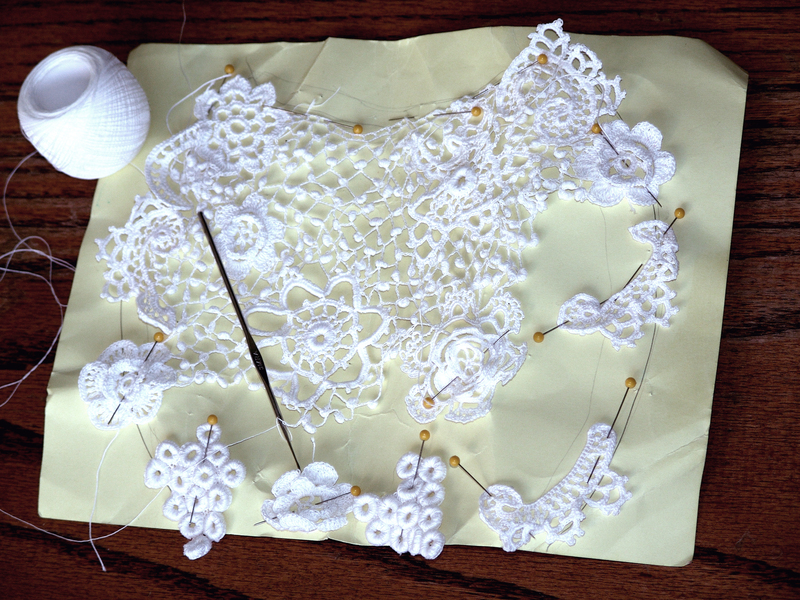 I began the process of preparing the lace for the altar, first shrinking, then blocking, hoping it would really fit. When it was done, I measured it again. The lace matched the altar to the inch in both directions– without a single additional motif. I was so excited, I couldn’t wait to tell her about how perfect it was, and thank her. What a wonderful gift! I edged the piece with a simple Irish edging to honor Mary Jo’s Scotch-Irish heritage, snapped a few pictures for her family, and brought her beautiful lace to the temple. Her gift to the Lord now sits on that delicate altar. Little miracles. 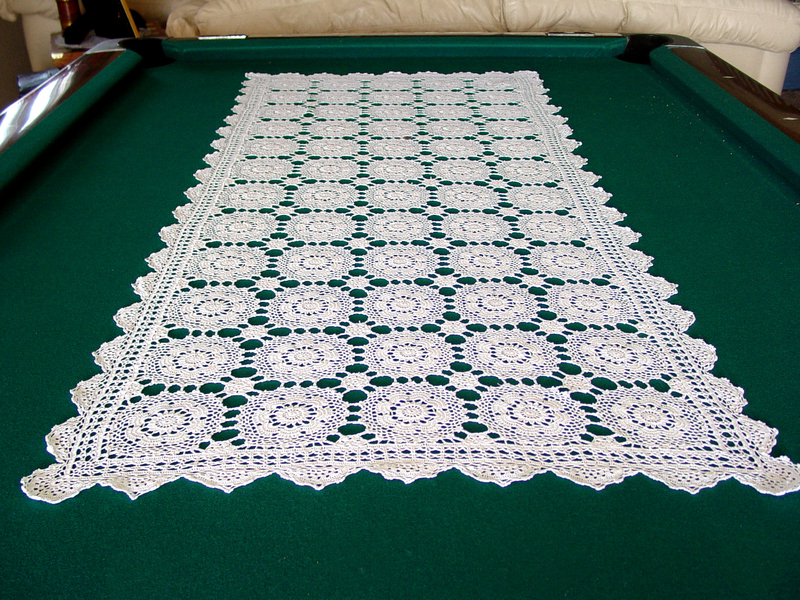 “Pond Lily” lace: blocked with border, just the right size. I like to feature the laces of other LDS lacemakers. 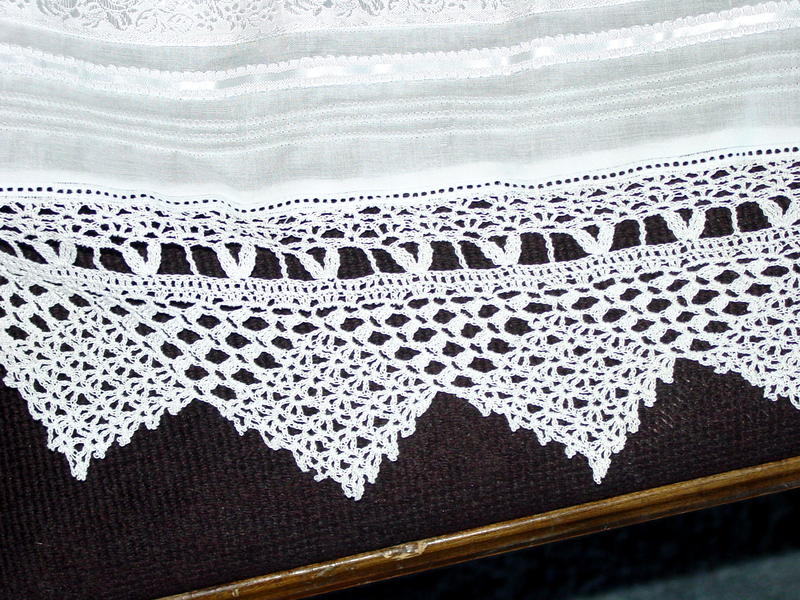 This altar cloth lace was made by my mother-in-law, Mary Rockwood. It’s from a vintage pattern called “Grand Reception”. These are the pictures she sent me of it just before she gave it to her temple in Denver, Colorado. It turned out beautifully.